When Dolores DeMarco, 79, was diagnosed with an abdominal aortic aneurysm, she was shocked. At the time, the active Fall River resident “felt great” and walked 45 minutes a day, in addition to regular romps with her two great-grandbabies, ages 2 and 5. “My doctor spotted the aneurysm after I had a CT scan for something unrelated. I never suspected that anything was wrong,” DeMarco recalled. DeMarco’s story is not unusual; abdominal aortic aneurysms present few if any symptoms, but the diagnosis was only the first piece of shocking news headed her way. DeMarco’s doctors explained that repairing this type of aneurysm required radical open surgery followed by a long recovery period. When DeMarco learned that potential risks associated with the surgery could chip away at her quality of life, she decided to reject the option. However, DeMarco’s daughter, Arlene Gaw, a registered nurse, wasn’t willing to accept her mom’s decision as final — at least not without exploring all options. So the pair began to do just that. An abdominal aortic aneurysm, like the one DeMarco had, is a bulge in the aorta wall, the large blood vessel that carries oxygen-rich blood from the heart to the rest of the body. If the bulge ruptures, it causes potentially fatal uncontrolled internal bleeding. In DeMarco’s case, the chances of a fatal rupture would increase every year her aneurysm went untreated. 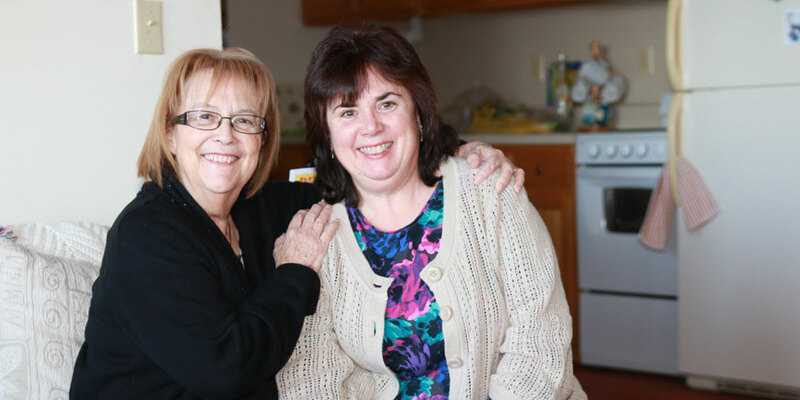 After some research, mother and daughter found a medical expert — right in their own backyard — who is experienced in an advanced and, critically, non-invasive procedure to treat abdominal aortic aneurysms. When DeMarco visited that expert, David L. Gillespie, MD, Southcoast Health’s Chief of Vascular and Endovascular Surgery at the Cardiovascular Care Center, she found his approach, confidence and experience “comforting.” That peace of mind, along with being able to have a relatively minimally invasive procedure done at nearby St. Luke’s Hospital in New Bedford — so close to home and family — meant the world to DeMarco. So with that, the surgery, known as a fenestrated aortic graft, was scheduled. This relatively new procedure requires just two 2-centimeter incisions in the patient’s leg, with the remaining surgery being done endovascularly (inside blood vessels). 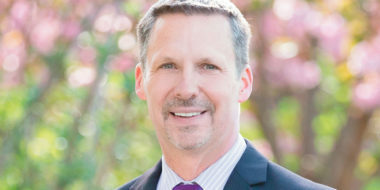 Surgeons like Dr. Gillespie use highly sophisticated image technology to guide a custom-made stent graft called an endograft, which has holes, called fenestrations, through the patient’s arteries. The fenestrated endovascular graft replaces the enlarged blood vessel and reopens blood flow through the aorta and to the kidneys and nearby organs. “In the past, community patients who required a fenestrated aortic graft had to travel to a large Boston medical center. 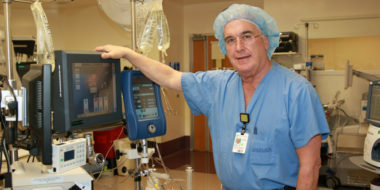 But between my experience and Southcoast’s visionary dedication to building the highest level of vascular and endovascular surgical care possible, I’ve been able to create the multidisciplinary team needed to perform advanced procedures like this one,” Dr. Gillespie said. That team includes vascular surgery, interventional radiology, anesthesiology, cardiology and cardiothoracic surgery. From a technology perspective, providing this level of advanced care also requires a highly evolved hybrid operating room, currently complete at Southcoast’s St. Luke’s Hospital and under construction at Charlton Memorial Hospital. A hybrid operating room combines sophisticated diagnostic and operative equipment with the most advanced imaging programs, which allows a multi-disciplinary medical team to work in concert. 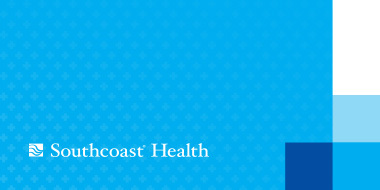 For more about Southcoast Health’s endovascular services and vascular specialists, visit southcoast.org/endovascular. To treat Dolores DeMarco’s abdominal aortic aneurysm, David L. Gillespie, MD, Southcoast Health’s Chief of Vascular and Endovascular Surgery at the Cardiovascular Care Center, and his team performed a relatively new procedure known as a fenestrated aortic graft. More advanced than other commercially available aortic endografts, the Cook Z-FEN fenestrated aortic endograft, has holes (or “fenestrations”) that allow physicians to treat patients with juxtarenal (near the kidney) aortic aneurysms. Dr. Gillespie worked with representatives from Cook Medical Inc. to build this custom fenestrated aortic endograft in their Australian plant. Using information from a CT scan of DeMarco’s aorta, Dr. Gillespie was able to design a custom stent graft using computer assisted design (CAD) software available only at Southcoast. The result is a one-of-a-kind solution whose size, shape and features are custom-fit for DeMarco’s anatomy.